King of Thieves is the biggest and flashiest of the four adaptations made in the wake of the 2015 Hatton Garden safe deposit robbery (two others have been released already, the fourth is a TV series that has already had its airdate postponed twice). Although James Marsh's take has substantial star power on its side, it's every bit as tedious as the previous versions thanks to a lacklustre script and colourless direction. 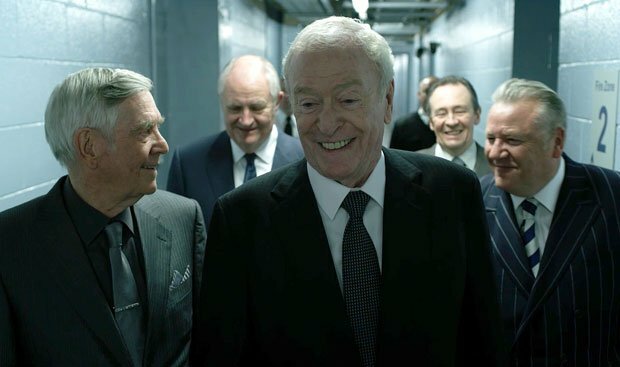 This time round, Michael Caine plays octogenarian gangster Brian Reader, who's recruited by mysterious young acquaintance Basil (Charlie Cox) for a can't-go-wrong robbery of the Hatton Garden vaults. At his wife's funeral, Brian puts together a team of old codgers that includes cantankerous rival Terry Perkins (Jim Broadbent), doddery John 'Kenny' Collins (Tom Courtenay) and sweary wide-boy Danny Jones (Ray Winstone), with later assistance from allotment fanatic Carl Wood (Paul Whitehouse) and giggly incontinent Billy 'The Fish' Lincoln (Michael Gambon). The heist proves a success, but the gang are plagued by greed and paranoia that threatens to tear them apart, even as the police are closing in. Marsh (The Theory of Everything, Man on Wire) has an affinity for true stories and seems a shrewd choice, but his direction is oddly flat, suggesting his heart wasn't really in it. He's not helped by an unusually drab colour palette that seems determined to discover whether there really are fifty shades of grey. One notable element is that, rather than present the characters as loveable old Cockney rogues, Joe Penhall's script strives to make them all as horrible as possible, with Broadbent particularly impressive in that regard. However, it's a decision that ultimately has disastrous consequences, because they're so irredeemably nasty that you don't want to spend any time with them. The gang are also painfully underdeveloped, coming across less as fleshed-out individuals and more a collection of old-age complaints and foul-mouthed tirades. There are other interesting touches that end up backfiring: at one point, clips from the stars' old movies are used to illustrate their criminal pasts, resulting in unintentional laughter when they end up using The Fast Show for Whitehouse. General release from Fri 14 Sep.
Brian (Caine) is an octogenarian gangster who puts together a team of old codgers to rob the Hatton Garden diamond vaults. The biggest and flashiest of the four versions so far of this story has lots of star power but a boring script, dislikeable characters and colourless direction. Pointless and disappointing.